So … I’ve read a lot of things recently on DevOps, a lot of very interesting things … and, unfortunately, some pretty stupid as well. It seems a lot of people are increasingly considering that DevOps is resumed to mastering chef, puppet or docker containers. This really bothers me. DevOps is so much more than any tool such as puppet or docker. This could even make me angry. 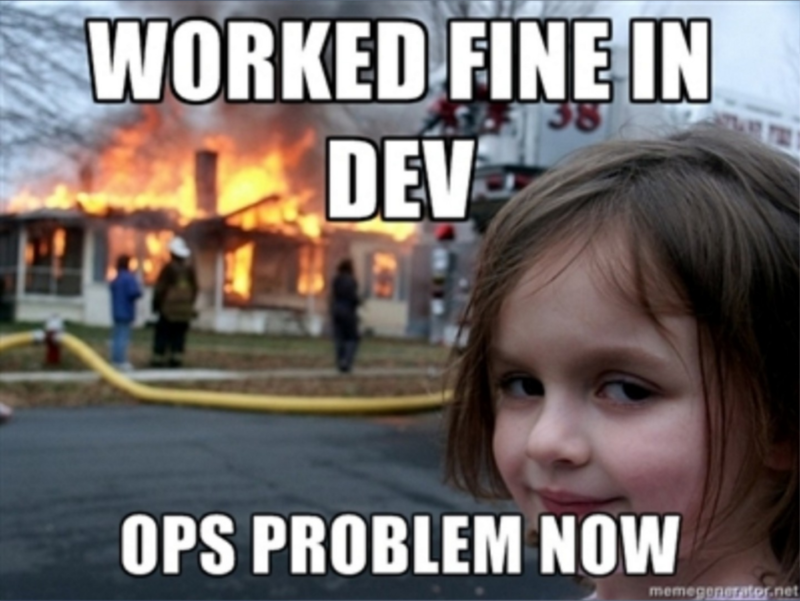 DevOps seems to me so important. I’ve spent 15 years working in the engineering business for very big institutions, mostly big financial institutions. DevOps is a very key methodology bringing principles and practices that address precisely the biggest problem, the saddest factor of failure of software development projects in such institutions : the wall of confusion between developers and operators. Don’t get me wrong, in most of these big institutions being still far from a large and sound adoption of an Agile Development Methodology beyond some XP practices, there are many other reasons explaining the failure or slippage of software development projects. 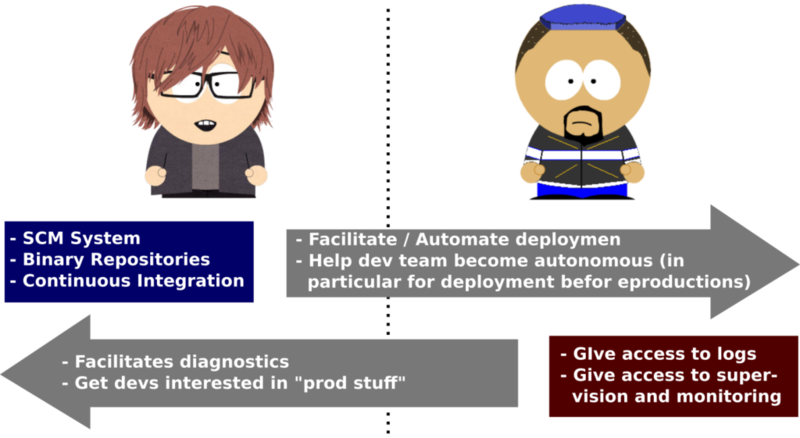 So yeah… Instead of getting angry I figured I’d rather present here in a concrete and as precise as possible article what DevOps is and what it brings. Long story short, DevOps is not a set of tools. 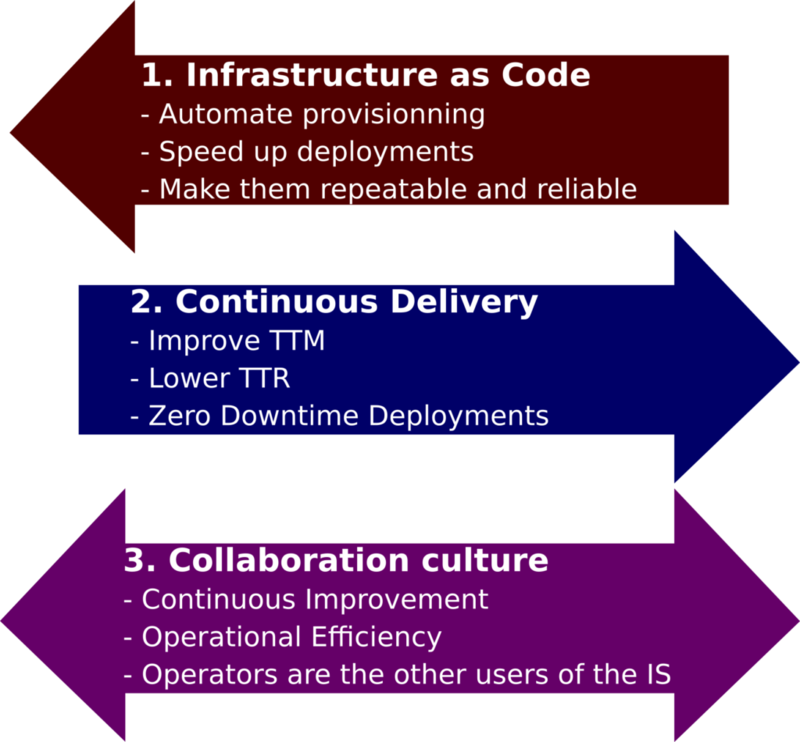 DevOps is a methodology proposing a set of principles and practices, period. The tools, or rather the toolchain – since the collection of tools supporting these practices can be quite extended – are only intended to support the practices. In the end, these tools don’t matter. The DevOps toolchains are today very different than they were two years ago and will be very different in two years. Again, this doesn’t matter. What matters is a sound understanding of the principles and practices. Presenting a specific toolchain is not the scope of this article, I won’t mention any. There are many articles out there focusing on DevOps toolchains. I want here to take a leap backwards and present the principles and practices, their fundamental purpose since, in the end, this is what seems most important to me. The problem comes from the fact that developers and operators – while both required by corporations with large IT departments – have very different objectives. This difference of objectives between developers and operators is called the wall of confusion. We’ll see later precisely what that means any why I consider this something big and bad. DevOps is a methodology presenting a set of principles and practices (tools are derived from these practices) aimed at having both these personas working towards an unified and common objective : deliver as much value as possible for the company. And surprisingly, for once, there is a magic silver bullet for this. Very simply, the secret is to bring agility to the production side! And that, precisely that and only that, is what DevOps is about ! But there are quite a few things I need to present before we can discuss this any further. What is the sinews of war of IT Management ? 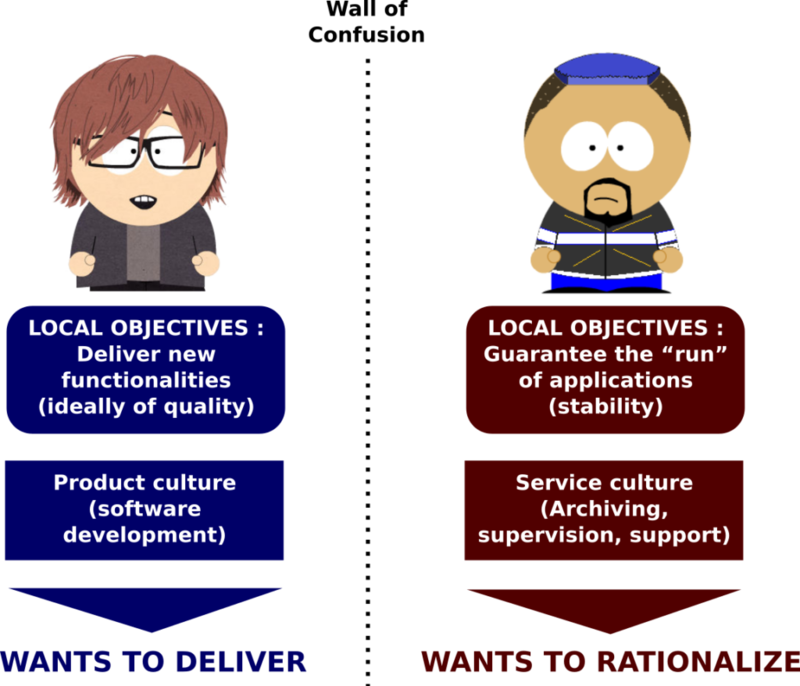 In other words, when it comes to Software Development Projects, what does management want first and foremost ? Let me put you on tracks : what is utmost important when developing a startup ? Improve Time To Market (TTM) of course ! The Time To Market or TTM is the length of time it takes from a product being conceived until its being available to users or for sale to customers. TTM is important in industries where products are outmoded quickly. In software engineering, where approaches, business and technologies change almost yearly, the TTM is a very important KPI (Key Performance Indicator). The TTM is also very often called Lead Time. A first problem lays in the fact (as believed by many) that TTM and product quality are opposing Attributes of a development process. As we will see below, improving quality (and hence stability) is the objective of operators while reducing lead time (and hence improving TTM) is the objective of developers. Let me explain this. An IT organization or department is often judged on these two key KPIs : the quality of the software, where the target is to have as little defects as possible, and the TTM, where the target is to be able to go from business ideas (often given by business users) to production – making the feature available to users or customers – as soon as possible. The problem here is that most often these two distinct objectives are supported by two different teams : the developers, building the software, and the operators, running the software. Mostly for historical reasons (operators come from the hardware and telco business most often), operators are not attached to the same branch than developers. Developers belong to R&D while operators most of the time belong to Infrastructure department (or dedicated operation department). In addition, and as a sidenote, these both teams sometimes even run on different budget. The development team uses the build budget while the operation team uses the run budget. These different budgets and the increasing needs to control and shorten the costs of IT in corporation tend to emphasize the opposition of objectives of the different teams. This is actually a pretty crazy KPI, one that should have been followed much sooner. The truth is, operator teams have been since their inception in the early age of Computer Engineering – 40 years ago, at the time computers were massively introduced in the industry – this kind of hackers running tons of commands manually to perform their tasks. They are used to long checklists of commands or manual processes to perform their duties. Somehow, they suffer from the „We always did it like this“ syndrome and challenged very little their ways of working over these 40 years. But if you think of it, this is really crazy. In average, operators spend almost 50% of their time doing deployment related tasks! Automate the deployments to reduce the 31% time dedicated to these currently manual tasks. 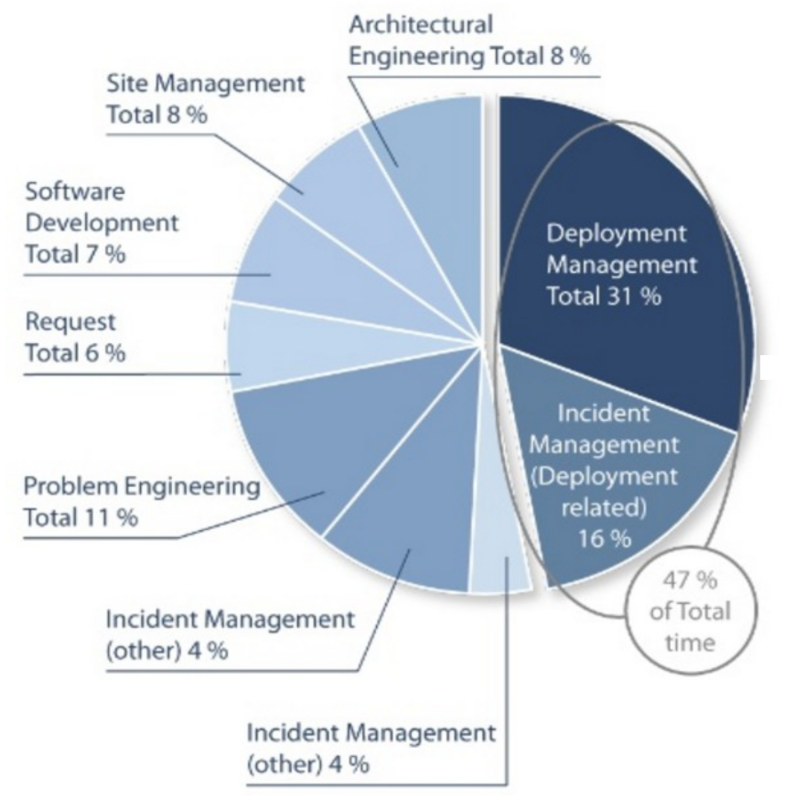 Industrialize them (just as software development has been industrialized, thanks to XP and Agile) to reduce the 16% related to fixing these deployment related issues. With only 5 manual commands, the probability of succeeding an installation drops to 86% already. With 55 manual commands, the probability of succeeding an installation drops to 22%. Succeeding the installation means that the software behaves in production as intended. Failing it means something will go wrong and some analysis will be required to understand what went wrong with the installation and some patches will need to be applied or some configuration corrected. So automating all of this and avoiding manual commands at all cost seems to be rather a good idea, doesn’t it ? 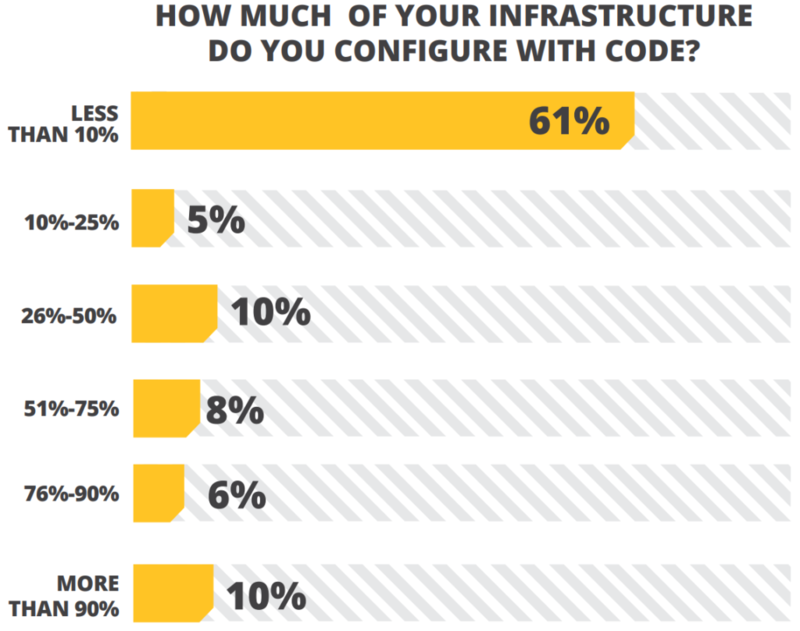 Nonetheless, this gives a pretty good idea of how much is still to be accomplished in regards to Infrastructure automation and how much DevOps principles and practices are very important. Again the web giants had to come up with a new approach, with new practices to address their needs of responsivness. What they started their engineering business in their early days, the practices they put in place is at the root of what is today DevOps. Netflix designs for failure! The software is designed from the grounds up to tolerate system failures. They test it all the time in production: 65’000 failure tests in production daily by killing random virtual machines … and measuring that everything still behaves OK. So what is their secret ? DevOps consists mostly in extending agile development practices by further streamlining the movement of software change thru the build, validate, deploy and delivery stages, while empowering cross-functional teams with full ownership of software applications – from design thru production support. We’ll now dig into these 3 essential principles. Because humans make mistakes, because the human brain is terribly bad at repetitive tasks, because humans are slow compared to a shell script, and because we are humans after all, we should consider and handle infrastructure concerns just as we handle coding concerns! Infrastructure as code (IaC) is the prerequisite for common DevOps practices such as version control, code review, continuous integration and automated testing. It consists in managing and provisioning computing infrastructure (containers, virtual machines, physical machines, software installation, etc.) and their configuration through machine-processable definition files or scripts, rather than the use of interactive configuration tools and manual commands. I cannot stress enough how much this is a key principle of DevOps. It is really applying software development practices to servers and infrastructure. 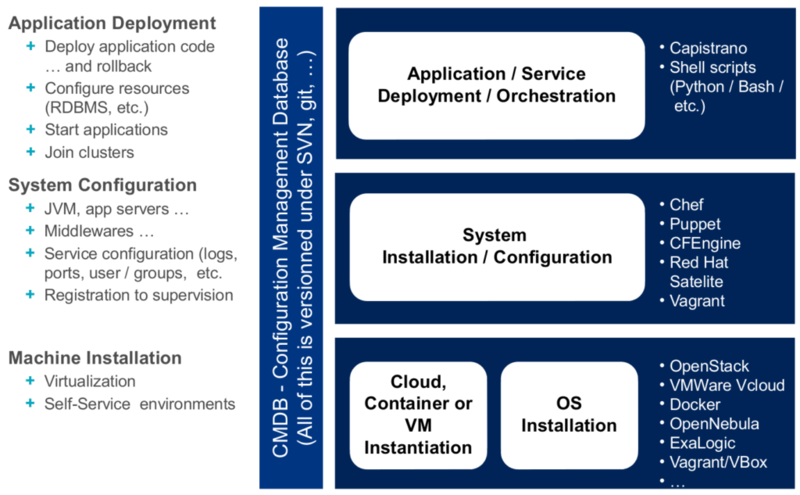 Cloud computing enables complex IT deployments modeled after traditional physical topologies. We can automate the build of complex virtual networks, storage and servers with relative ease. Every aspect of server environments, from the infrastructure down to the operating system settings, can be codified and stored in a version control repository. The tools proposed as examples on the schema above are very much oriented towards building the different layers. But a devops toolchain does much more than that. I think it’s time I tell a little more about the notion of DevOps Toolchains. Though there are many tools available, certain categories of them are essential in the DevOps toolchain setup for use in an organization. Tools such as Docker (containerization), Jenkins (continuous Integration), Puppet (Infrastructure building) and Vagrant (virtualization platform) among many others are often used and frequently referenced in DevOps tooling discussions as of 2016. The ability to version the infrastructure – or rather the infrastructure building scripts or configuration files – as well as the ability to automated test it are very important. DevOps consists in finally adopting the same practices XP brought 30 years ago to software engineering to the production side. Even further, Infrastructure elements should be continuously integrated just as software deliverables. Repeatability and Reliability : building the production machine is now simply running that script or that puppet command. With proper usage of docker containers or vagrant virtual machines, a production machine with the Operating System layer and, of course, all the software properly installed and configured can be set up by typing one single command – One Single Command. And of course this building script or mechanism is continuously integrated upon changes or when being developed, continuously and automatically tested, etc. Finally we can benefit on the operation side from the same practices we use with success on the software development side, thanks to XP or Agile. Time to recovery ! : one click recovery of the production environment, period. Guarantee that infrastructure is homogeneous : completely eliminating the possibility for an operator to build an environment or install a software slightly differently every time is the only way to guarantee that the infrastructure is perfectly homogeneous and reproducible. Even further, with version control of scripts or puppet configuration files, one can rebuild the production environment precisely as it was last week, last month, or for that particular release of the software. Make sure standards are respected : infrastructure standards are not even required anymore. The standard is the code. Allow developer to do lots of tasks themselves : if developers become themselves suddenly able to re-create the production environment on their own infrastructure by one single click, they become able to do a lot of production related tasks by themselves as well, such as understanding production failures, providing proper configuration, implementing deployment scripts, etc. These are the few benefits of IaC that I can think of by myself. I bet there are so many much more (suggestions in comments are welcome). Continuous delivery is an approach in which teams produce software in short cycles, ensuring that the software can be reliably released at any time. It aims at building, testing, and releasing software faster and more frequently. The approach helps reduce the cost, time, and risk of delivering changes by allowing for more incremental updates to applications in production. A straightforward and repeatable deployment process is important for continuous delivery. The more often you deploy, the more you master the deployment process and the better you automate it. If you have to do something 3 times a day, you will make it bullet proof and reliable soon enough, when you will be fed up of fixing the same issues over and over again. The more often you deploy, the best will be your TTR (Time to Repair / Resolution) and hence the sooner will be the feedback you will get from your business users regarding that feature and the easier it will be to change some things here and there to make it perfectly fit their needs (TTR is very similar to TTM in this regards). Continuous Delivery is key to be able to learn from the field. There is no truth in the development team, the truth lies in the head of the business users. Unfortunately, no one is able to really clearly express his mind, his will in a specification document, no matter the time he dedicates to this task. This is why Agility attempts to put the feature in the hands of the users to get their feedback as soon as possible, at all cost. But the truth doesn’t come out in the form of a formal user feedback. One should never trust its users or rely on formal feedback to learn from users. One should trust its own measures. 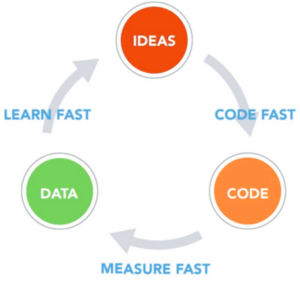 Measure obsession is a very important notion from the Lean Startup movement but it’s also very important in DevOps. One should measure everything! Finding the right metrics enabling the team to learn about the success or failures of an approach, about what would be better and what has the most success can be sometimes tricky. One should always take too many measures instead of missing the one that would enable the team to take an enlightened decision. Don’t think, know! And the only way to know is to measure, measure everything: response times, user think times, count of displays, count of API calls, click rate, etc. but not only. Find out about all the metrics that can give you additional insights about the user perception of a feature and measure them, all of them! Automation has already been discussed above in section 2. Infrastructure as code. I just want to emphasize here that continuous delivery is impossible without a properly and 100% automation of all infrastructure provisioning and deployment related tasks. This is very important, let me repeat it once more: setting up an environment and deploying a production ready version of the software should take one click, one command, it should be entirely automated. Without it, it’s impossible to imagine deploying the software several times a day. In section 3.5 Zero Downtime Deployments below we will mention additional important techniques helping Continuous Delivery as well. This idea of doing painful things more frequently is very important in agile thinking. Automated Testing, refactoring, database migration, specification with customers, planning, releasing – all sorts of activities are done as frequently as possible. Firstly most of these tasks become much more difficult as the amount of work to be done increases, but when broken up into smaller chunks they compose easily. The second reason is Feedback. Much of agile thinking is about setting up feedback loops so that we can learn more quickly. Feedback was already an important and explicit value of Extreme Programming. In a complex process, like software development, one has to frequently check where one stands and make course corrections. To do this, one must look for every opportunity to add feedback loops and increase the frequency with which one gets feedback so one can adjust more quickly. The third reason is practice. With any activity, we improve as we do it more often. Practice helps to iron out the kinks in the process, and makes one more familiar with signs of something going wrong. If you reflect on what you are doing, you also come up with ways to improve your practice. With software development, there’s also in addition the potential for automation. Once one has done something a few times, it’s easier to see how to automate it, and more importantly one becomes more motivated to automate it. Automation is especially helpful because it can increase speed and reduce the chance for error. What does one need before being able to move to Continuous Delivery? Continuous integration of both the software components development as well as the platform provisioning and setup. TDD – Test Driven Development. This is questionable … But in the end let’s face it: TDD is really the single and only way to have an acceptable coverage of the code and branches with unit tests (and unit tests makes is so much easier to fix issues than integration or functional tests). Code reviews ! At least codereviews … pair programming would be better of course. Continuous auditing software – such as Sonar. Plus sound software development practices when it comes to managing big features and evolutions, such as Zero Downtime Deployments techniques. ZDD consists in deploying an application in such a way that one introduces a new version of an application to production without making the user see that the application went down in the meantime. From the user’s and the company’s point of view it’s the best possible scenario of deployment since new features can be introduced and bugs can be eliminated without any outage. Feature flipping allows to enable / disable features while the software is running. It’s really straightforward to understand and put in place: simply use a configuration properly to entirely disable a feature from production and only activate it when its completely polished and working well. The idea of Dark Launch is to use production to simulate load! It’s difficult to simulate load of a software used by hundreds of millions of people in a testing environment. Without realistic load tests, it’s impossible to know if infrastructure will stand up to the pressure. Instead of simulating load, why not just deploy the feature to see what happens without disrupting usability? Facebook calls this a dark launch of the feature. Let’s say you want to turn a static search field used by 500 million people into an autocomplete field so your users don’t have to wait as long for the search results. You built a web service for it and want to simulate all those people typing words at once and generating multiple requests to the web service. The dark launch strategy is where you would augment the existing form with a hidden background process that sends the entered search keyword to the new autocomplete service multiple times. If the web service explodes unexpectedly then no harm is done; the server errors would just be ignored on the web page. But if it does explode then, great, you can tune and refine the service until it holds up. There you have it, a real world load test. Blue/Green Deployments consists in building a second complete line of production for version N + 1. Both development and operation teams can peacefully build up version N + 1 on this second production line. Whenever the version N + 1 is ready to be used, the configuration is changed on the load balancer and users are automatically and transparently redirected to the new version N + 1. At this moment, the production line for version N is recovered and used to peacefully build version N + 2. This is quite effective and easy but the problem is that it requires to double the infrastructure, amount of servers, etc. Imagine if Facebook had to maintain a complete second set of its hundreds of thousands of servers. So there is some room for something better. Canari release is very similar in nature to Blue/Green Deployments but it addresses the problem to have multiple complete production lines. The idea is to switch users to the new version in an incremental fashion : as more servers are migrated from the version N line to the version N + 1 line, an equivalent proportion of users are migrated as well. This way, the load on every production line matches the amount of servers. At first, only a few servers are migrated to version N + 1 along with a small subset of the users. This also allows to test the new release without risking an impact on all users. When all servers have eventually been migrated from line N to line N + 1, the release is finished and everything can start all over again for release N + 2. 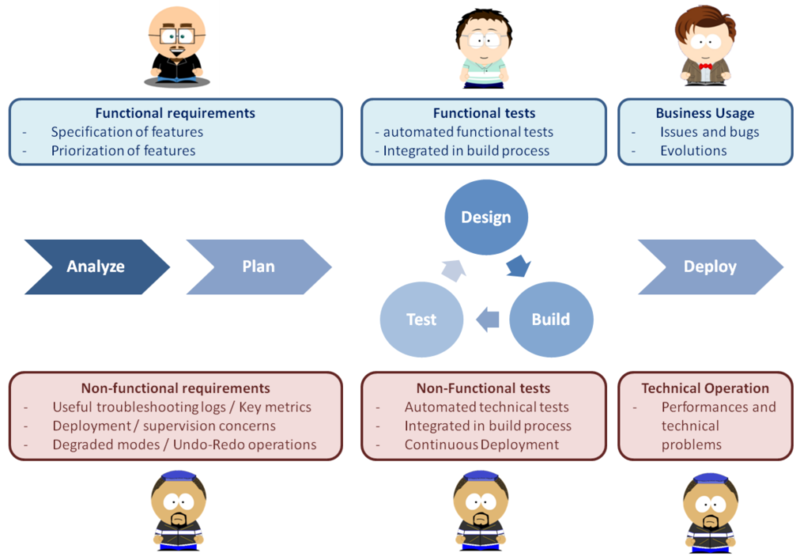 Agile software development has broken down some of the silos between requirements analysis, testing and development. Deployment, operations and maintenance are other activities which have suffered a similar separation from the rest of the software development process. 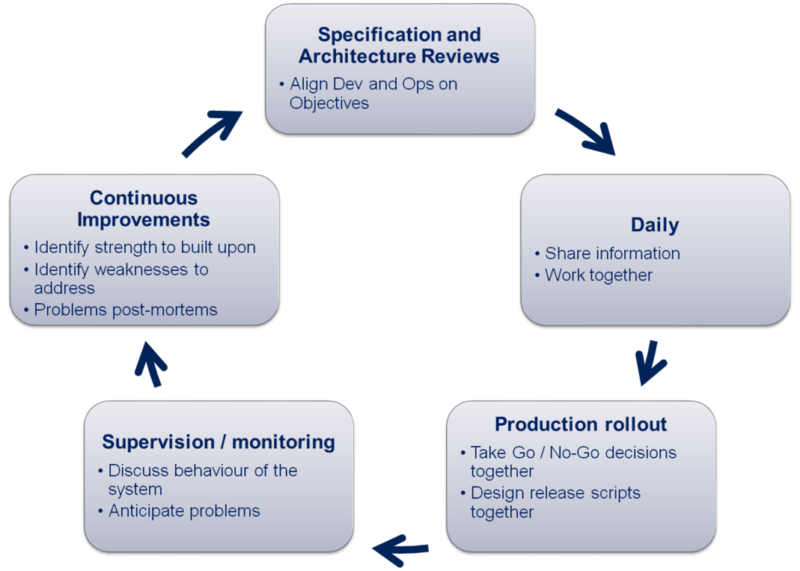 The DevOps movement is aimed at removing these silos and encouraging collaboration between development and operations. Even with the best tools, DevOps is just another buzzword if you don’t have the right culture. The primary characteristic of DevOps culture is increased collaboration between the roles of development and operations. There are some important cultural shifts, within teams and at an organizational level, that support this collaboration. Team play is so important to DevOps that one could really sum up most of the methodology’s goals for improvement with two C’s: collaboration and communication. While it takes more than that to truly become a DevOps workplace, any company that has committed to those two concepts is well on its way. But why is it so difficult ? In a traditional development cycle, the development team kicks things off by „throwing“ a software release „over the wall“ to Operations. Operations picks up the release artifacts and begins preparing for their deployment. Operations manually hacks the deployment scripts provided by the developers or, most of the time, maintains their own scripts. They also manually edit configuration files to reflect the production environment, which is significantly different than the Development or QA environments. At best they are duplicating work that was already done in previous environments, at worst they are about to introduce or uncover new bugs. The IT Operations team then embarks on what they understand to be the currently correct deployment process, which at this point is essentially being performed for the first time due to the script, configuration, process, and environment differences between Development and Operations. Of course, somewhere along the way a problem occurs and the developers are called in to help troubleshoot. Operations claims that Development gave them faulty code. Developers respond by pointing out that it worked just fine in their environments, so it must be the case that Operations did something wrong. Developers are having a difficult time even diagnosing the problem because the configuration, file locations, and procedure used to get into this state is different then what they expect. Time is running out on the change window and, of course, there isn’t a reliable way to roll the environment back to a previously known good state. So what should have been an eventless deployment ended up being an all-hands-on-deck fire drill where a lot of trial and error finally hacked the production environment into a usable state. It always happens this way, always. Below is a simplified view of how the Agile Software Development Process usually looks like. Initially the business representatives work with the Product Owner and the Architecture Team to define the software, either through Story Mapping with User stories or with more complete specification. Then the development team develops the software in short development sprints, shipping a production ready version of the software to the business users at the end of every sprint in order to capture feedback and get directions as often and as much as possible. Finally, after every new milestone, the software is deployed for wide usage to all business lines. 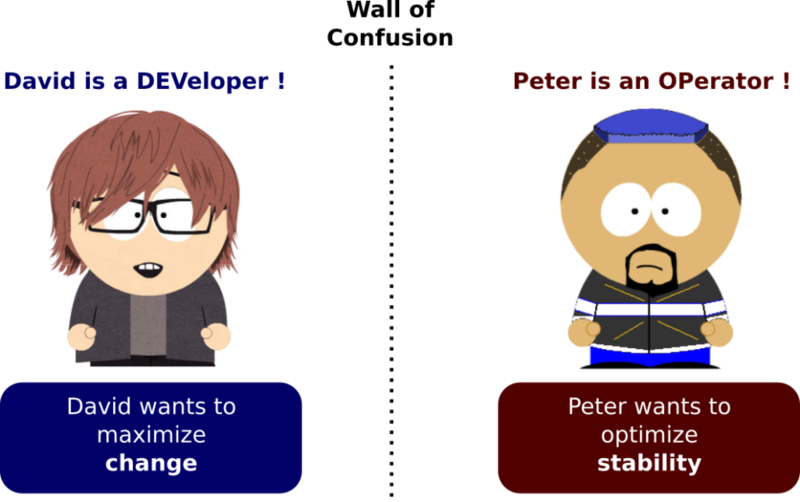 The big change introduced by DevOps is the understanding that operators are the other users of the software ! and as such they should be fully integrated in the Software Development Process. At specification time, operators should give their non-functional requirements just as business users give their functional requirement. Such non-functional requirements should be handled with same important and priority by the development team. At implementation time, operators should provide feedback and non-functional tests specifications continuously just as business users provides feedback on functional features. Finally, operators become users of the software just as business users. With DevOps, operators become fully integrated in the Software Development Process. One should note that this can be difficult to achieve. For instance for regulation or security reasons, logs may need to be anonymized on the fly, supervision tools need to be secured to avoid an untrained and forbidden developer to actually change something in production, etc. This may take time and cost resources. But the gain in efficiency is way greater that the required investment, and the ROI of this approach for the whole company is striking. Inspired from the XP practice „onsite customer„, which motivates agile developers to work closely with the business, disciplined agilists take this one step further with the practice of active stakeholder participation, which says that developers should work closely with all of their stakeholders, including operations and support staff. This is a two-way street: operations and support staff must also be willing to work closely with developers. And many more examples such as those every day …. every day! Happily DevOps is several years old and increasingly even these very traditional corporations are moving in the right direction by adopting DevOps principles and practices. But a lot remains to be done. 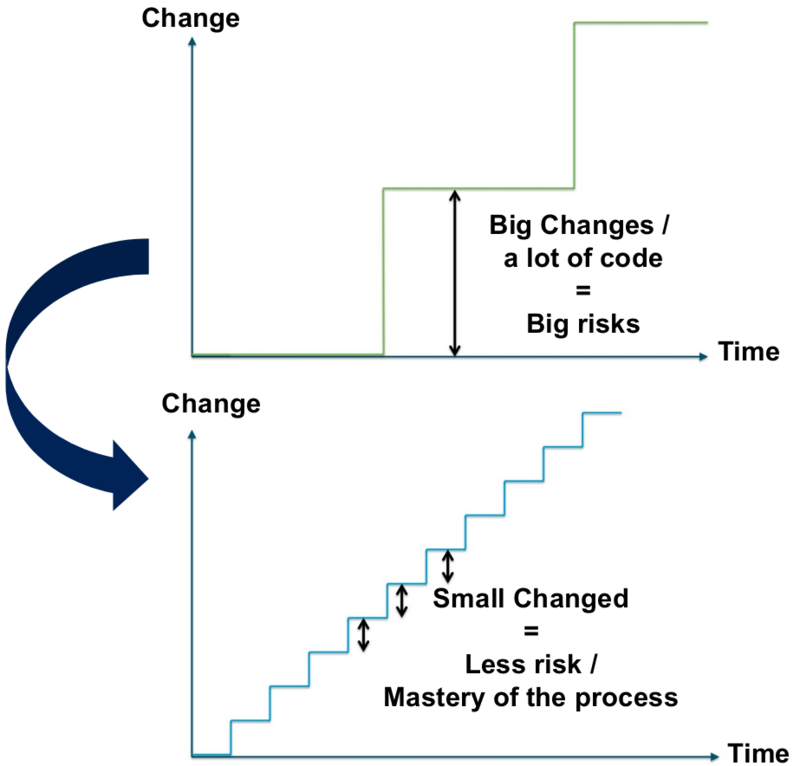 DevOps is simply a step further towards Scaling Agility! 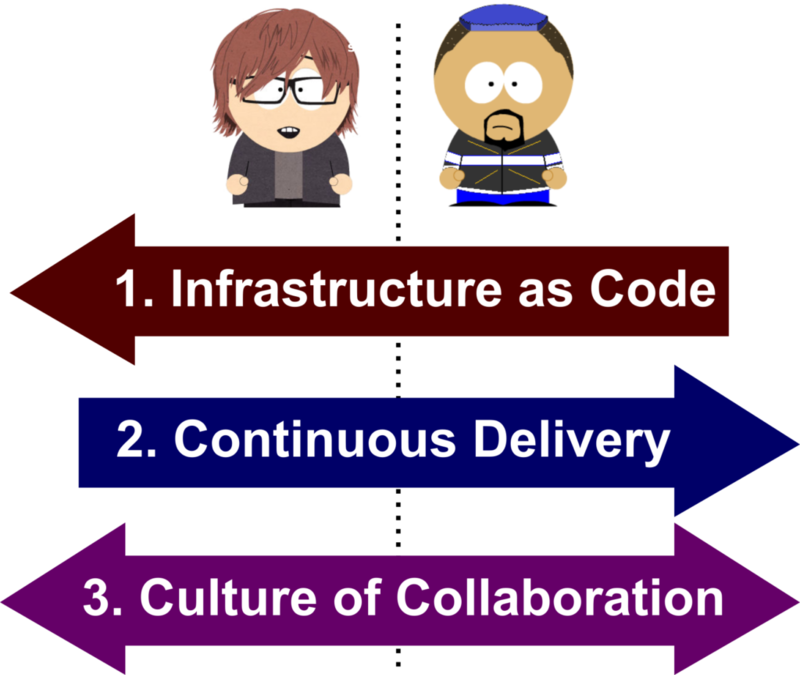 Amazing article that explains what DevOps really means. Congrats! 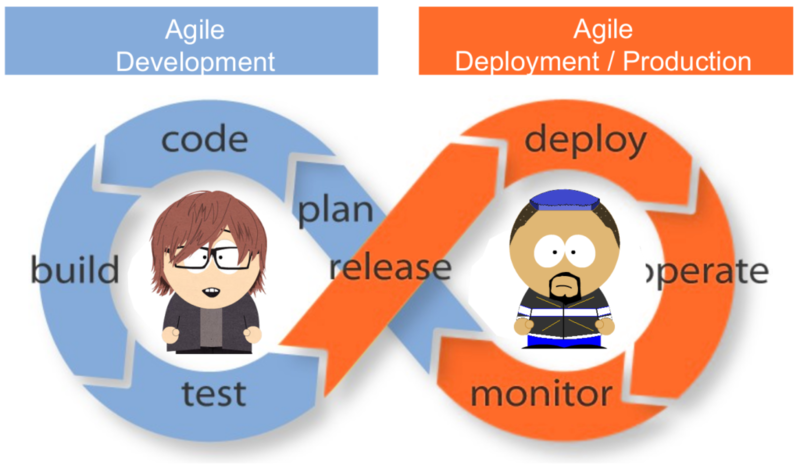 Greatly explained How DevOps Collaborative environment helps both Development and Testing teams. Seems simple and very easy to understand. Great work, many thanks for this master piece article. Wow, one of the best explanations I’ve seen so far! The devops way is so vast that it’s hard to get the good stuff. You guys rock! Probably the first article, I have ever read on this topic, that explains DevOps the way one can understand immediately. Thank you!